The Directors of The Promotion Company are delighted to welcome a new member to the team. Ian Calvert has many years of experience in marketing and events within the public and higher education sectors. Providing valuable support to the sales and production departments, he has a particular focus on further enhancing our excellent customer service. 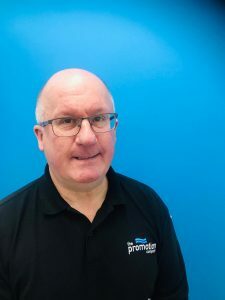 Ian is a people person who enjoys working with clients to ensure their chosen promotional items are of the highest quality and arrive within the deadline. The Promotion Company is now complemented by The Workwear Company which is focusing on clothing and accessories. Ian is working within both brands.